Thus patient presented with a seizure, preceeded by an aura of scotomata in the right visual field. The fistula is located away from the eye and ear, so there is no tinnitus or exophthalos. Other common symptoms include balance issues. 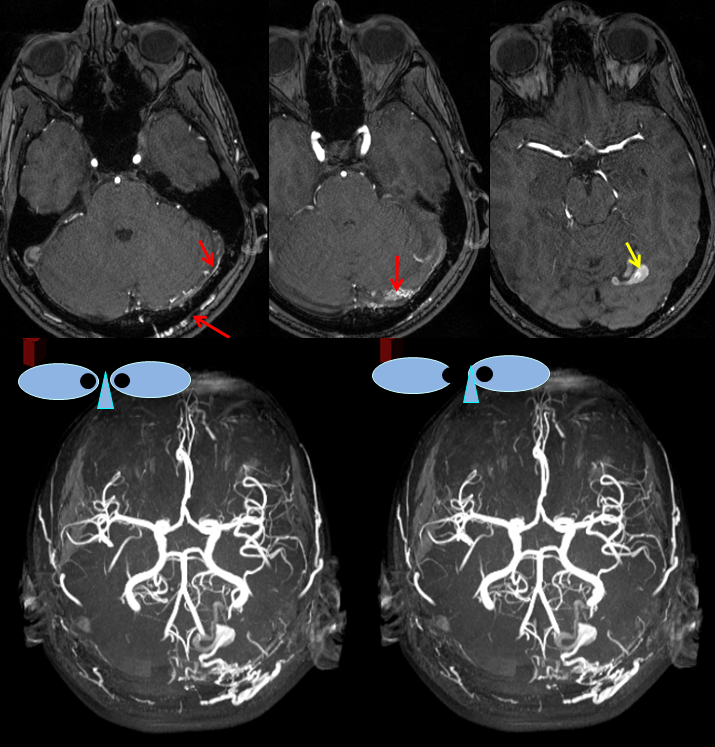 MRI images showing the aneurysm (yellow arrows) associated with the fistula; commonly, these aneurysms are located on the venous side, immediately distal to the fistula; in fact, identiflying such dilatation is helpful in deciding where artery ends and recepient vein begins. 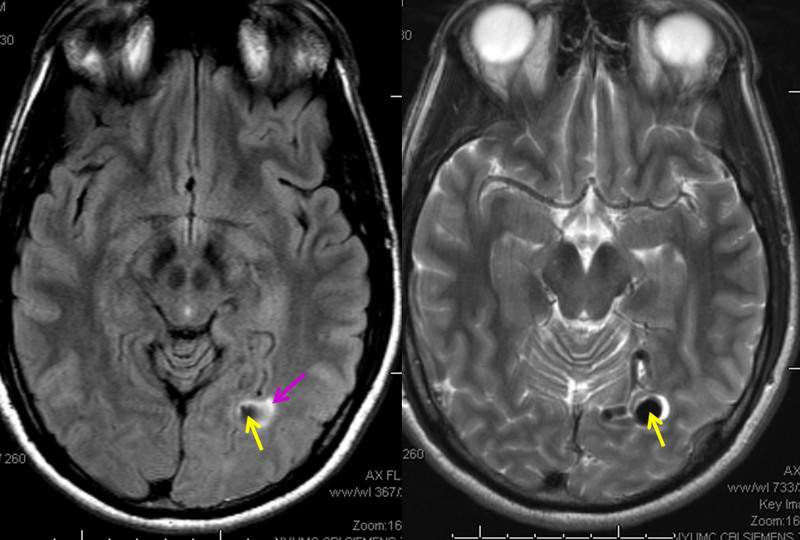 There is edema (swelling) present in the surrounding brain (pink arrow), as might be expected based on clinical presenation. Angiographic view of the right external carotid artery injection, showing small transmastoid occiptial artery vessels leading to the fistula (just a hint of what’s ahead). The fistula is off to the left. 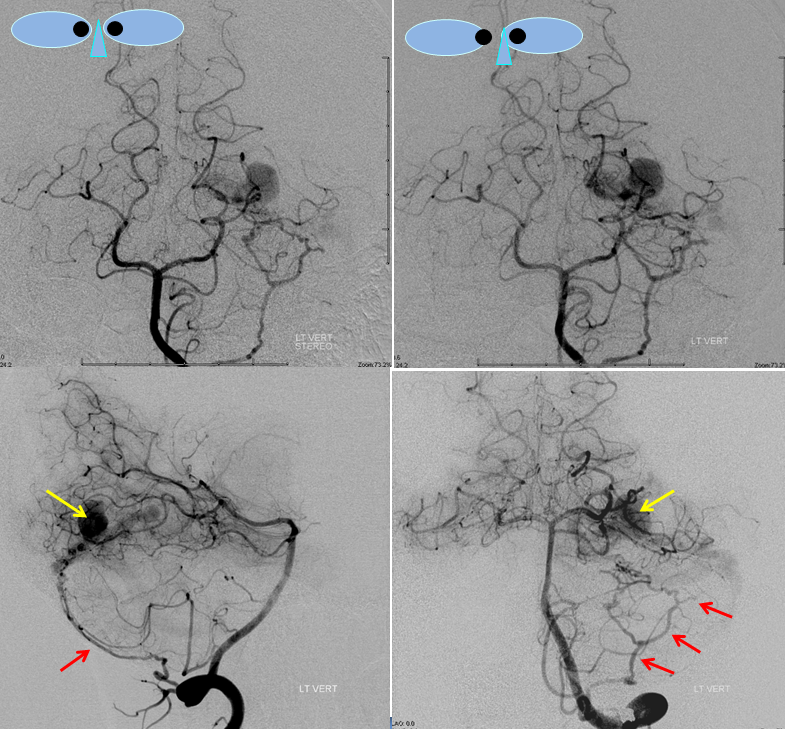 Injections of the left vertebral artery now clearly show the fistula and the associated venous aneurysm (yellow arrows); the fistula is supplied, in this case, by the posterior meningeal artery (red arrows). 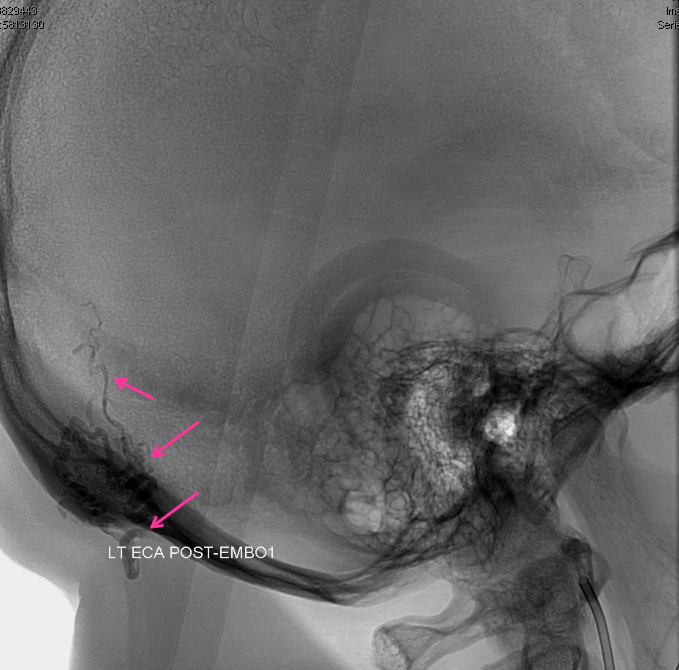 Finally, views of the left external carotid artery, showing transmastoid occipital artery (red) and middle meningeal arteries (pink) supplying the fistula. The fistula point is marked with orange, at convergence of feeding vessels, and venous aneurysm in yellow. 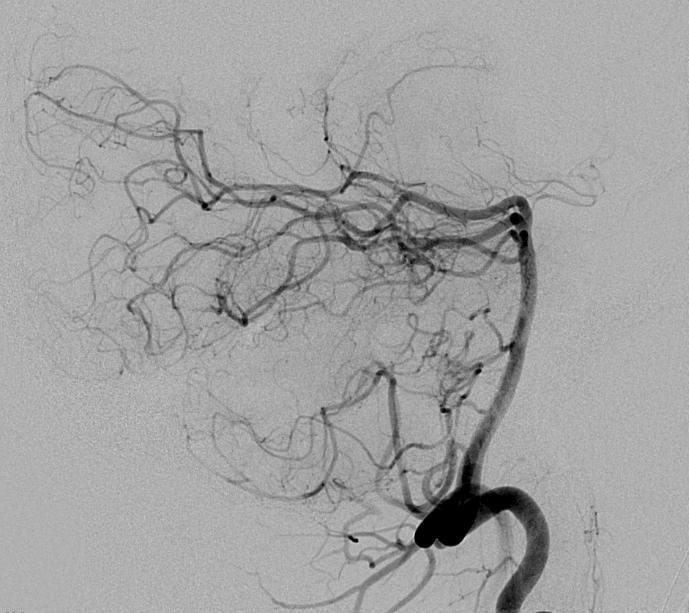 Treatment plan was transarterial n-BCA embolization, with goal of filling the aneurysm (thereby assuring that the fistula is also filled). A microcatheter (white arows) has been navigated into a small branch of the middle meningeal artery (it is obviously safer than going through branches of the vert), and the fistula (orange) is demonstrated from this position. An AVI movie of the same micro-injection is shown below. Glue was injected through the microcatheter to close the fistula. The microcatheter has been positioned into another branch of the middle meningeal artery, showing residual fistula and aneurysm. More glue is injected from this position. 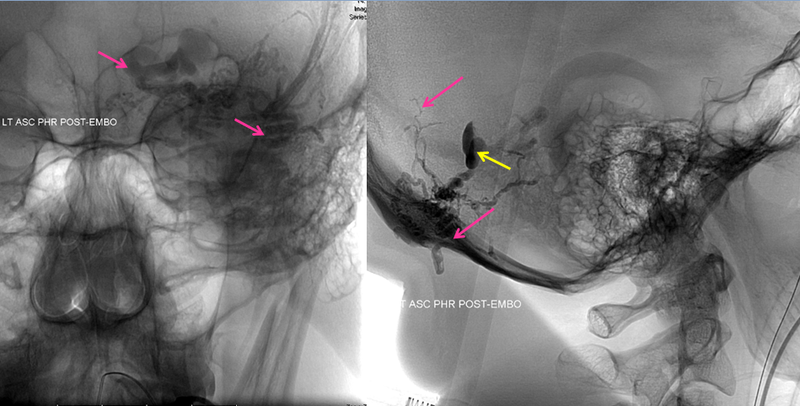 A new glue cast (pink arrows), larger than the first one, also shows glue in the aneurysm (yellow arrows). This is very good indication that the fistula is now “dead”. 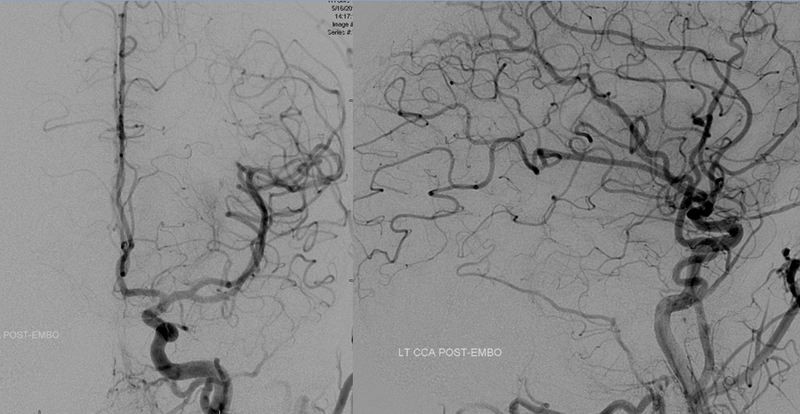 Post-embolization views of the left common carotid artery, showing that the fistula is gone. Right vertebral artery injection, also showing no more fistula.